April Special : Free Pick-Up for Businesses and Non-Profits! Learn More. All electronics are recycled in a safe manner with no impact to the environment. We only work with certified vetted processors. 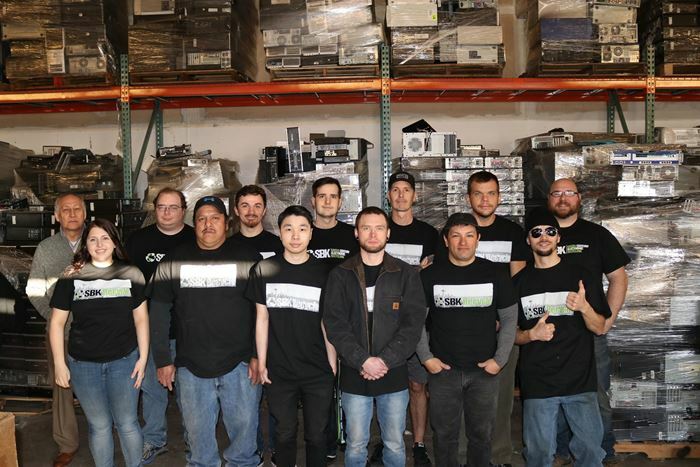 Our goal: to provide a viable alternative to e-waste in our landfills through refurbishing and reuse. We understand the needs of technology in today's world. That is why we have developed a way to recycle and re-use all the products we handle. Most computers and computer-related items are still working and may meet the needs of many people. We believe computer recycling should be about keeping these items alive as long as possible. We re-use and refurbish most of the computer-related items we receive. Unlike other recyclers who destroy all items whether they are working or not, we make sure to refurbish and save. We also practice safe and efficient recycling. All items are handled in a safe manner with no impact to the environment. We only work with certified vetted processors. Our goal is to reuse all items and extend life as long as possible to provide a viable alternative to e-waste in our landfills. SBK Recycle is a leading recycler of e-waste. Founded in 2008, we have developed a way to recycle and re-use most products we handle. Most computers and computer-related items are still working and may meet the needs of many people. SBK Recycle believes that our companies success is based on putting the customer first. This company's DNA runs on reuse. SBK Recycle has multiple locations in Washington State and Oregon that can help your business save money and recycle responsibly. Make SBK Recycle your complete and trusted E-Cycle provider. We accept most electronic devices. We are in business to provide safe and ethical recycling of electronic devices. "It was Primo! I so appreciate the Certificate of Destruction. The driver understood exactly what I was asking about." "My experience was great. The driver arrived within the time frame given and was quick to pick up the equipment. Very easy service to use. Thank you!" The purpose of being an electronic recycler is to reduce the effects of electronic waste on the environment by being committed to seeking alternate ways to recycle, refurbish and reuse electronics intended for disposal. Our operations are also designed to promote continual improvement within our health and safety, data security, and social accountability management systems, and other requirements. This applies to the electronics equipment, property, and assets under SBK Recycle ownership, as well as employees, contract workers, volunteers, and interns. To ensure that SBK Recycle LLC is transparent in all operations. SBK Recycle is committed to protecting the environment and the safety or our workers. All items are tested for functionality. Computer related items found to be working are refurbished or parted out to be sold or donated. We know that data security is a serious issue. All hard drives are wiped to DOD standards unless you request Data Destruction. Want to Get Rid of Your Old Electronics? We practice safe and efficient recycling in the Seattle and Tacoma areas. Our goal is to extend the life of used electronic items as long as possible to provide a viable alternative to e-waste in our landfills. We perform a complete data destruction on every item. We then refurbish and re-use most computer-related products.